“Our officers were attacked by a number of people, some of them masked, who threw stones. They felt under so much pressure that a shot had to be fired”, said police spokesperson Lars Bystrom. In the unrest, which began at around 8.30pm after a man was arrested next to Rinkeby metro station, a pedestrian on his way home was beaten and robbed and a press photographer was hospitalised after being attacked by a group of around 15 people. “I was hit with a lot of punches and kicks to the body and head, and spent the night in hospital”, the Dagens Nyheter photographer said. The riots continued late into the night, with police reporting later that shops were looted, and that a number of cars were set on fire during a second violent riot. “I’ve witnessed turmoil and civil unrest before, but this is something else. It looks like a war zone here”, said a freelance journalist working at the site of the clashes with state television outlet SVT. 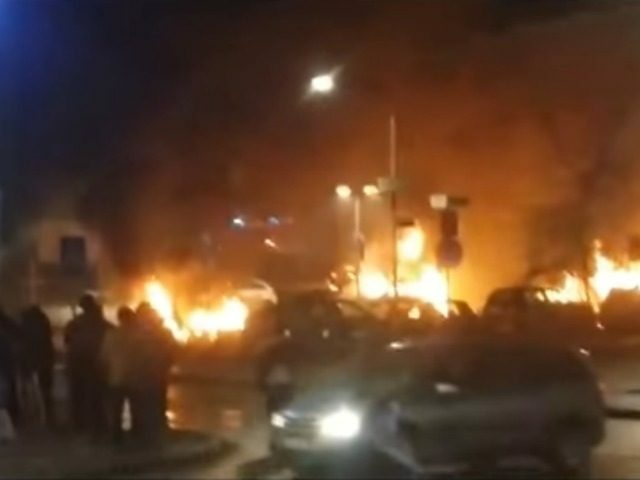 The shocking scenes in Rinkeby, where 61 per cent of residents were born abroad, come after Trump told a rally in Florida over the weekend that Sweden is “having problems like they never thought possible” as a result of mass migration. Worried about the nation’s image abroad, state broadcaster Sweden Radio last week aired a piece in English which claims that ‘no-go zones’ — dangerous suburbs where police fear to tread — don’t exist in the country. However, a report last September revealed that 80 per cent of police officers were considering switching careers due to the danger they face in the field. Breitbart London on Monday published a list of “Ten Reasons Sweden’s ‘Multicultural Utopia’ is Massively Failing”, which details some of the problems being experienced by the Scandinavian country as a result of mass migration from the third world which its government chooses to ignore.